Blowout Sale! Up to 60% off on Pants at Common Wealth. 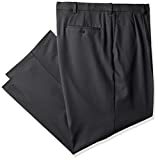 Top brands include Dockers, IZOD, Match, Haggar, Goodthreads, Southpole, Brooklyn Athletics, LEE, Mr.Zhang, Amazon Essentials, Victorious, Propper, & Columbia. Hurry! Limited time offers. Offers valid only while supplies last.